The learner driver must have the knowledge, understanding and skills to drive at a speed that is appropriate for the prevailing conditions. In doing so, the learner driver must take into account the safety of all occupants of the vehicle and that of all other road users, particularly vulnerable road users. Know and understand the need to assess and adjust the speed of the vehicle to suit the prevailing conditions. Be able to assess and adjust the speed of the vehicle to suit the prevailing conditions, in different situations and without undue hesitancy and be able to interpret the speed of other vehicles and react appropriately. 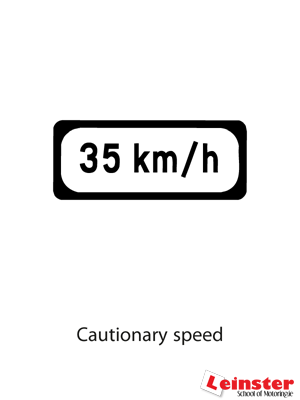 Know and understand why speed limits are necessary and be aware of the legal responsibility to comply with them. 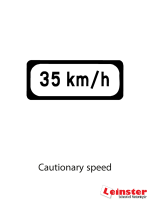 Be able to adjust the speed of the vehicle to comply with speed limits and be aware that speed limits are an upper limit only and not a target speed. 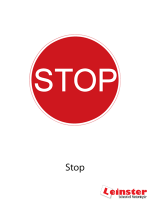 Be aware of stopping distances and of how the load in the vehicle or the weight of the vehicle may significantly affect stopping distance and be able to stop the vehicle at different speeds. Know and understand the stopping distances for vehicles in adverse weather conditions, at different speeds, and in different road conditions and be able to adjust speed of the vehicle to suit prevailing conditions. Be able to demonstrate the ability to drive at an appropriate speed at all times. Know and understand the potential consequences of driving too fast for the prevailing road and traffic conditions and understand how speed affects stopping distances. The learner driver must have a knowledge and understanding of the environmental impact of driving, and must be able to demonstrate the ability to drive in an eco-efficient manner. Know about and understand the environmental impact of driving and be able to demonstrate the ability to use the primary controls of the vehicle in a manner that is consistent with minimal environmental impact. Be able to plan a trip in the most eco-efficient manner be able to take different traffic conditions into account when planning a trip and be able to make good judgements on the necessity or otherwise of undertaking a journey. Understand the benefits of maintaining (where possible) a constant safe speed and avoiding unnecessary harsh braking or acceleration be able to demonstrate the ability (where possible) to maintain a constant safe speed and to avoid unnecessary harsh braking or acceleration. Understand how to use the gears and engine braking in ways that use fuel more economically; Be able to demonstrate the use of the gears and engine braking in ways that use fuel economically. The learner driver must have the knowledge, understanding and skills to be able to drive safely through traffic, and be able to recognise, interpret and manage risks – avoiding them where possible, and responding appropriately when they appear. The learner driver must have the knowledge, understanding and skills to drive independently and consistently, at different speeds and in challenging situations, while showing due care for him or herself and for all other road users. The learner driver must be able to read the road ahead, and to change direction or course in a safe and timely manner, and to do so on busier roads and junctions, on faster roads and roads with variable speeds, and on roads with complex layouts and complex lane changes. Know and understand when, where and why to yield to other road users; and when, where and why to progress. Understand the potential consequences of not yielding to others where it is appropriate and be able to yield or progress as necessary consistently and without prompting. The learner driver must have the knowledge, understanding and skills to anticipate and react to all imminent or potential hazards, to drive independently and consistently, to drive at different speeds, and to drive in a competent and defensive manner in challenging situations. The learner driver must be able to manage all hazards and risks while driving on busier roads and junctions, on faster roads and roads with variable speeds, and on roads with complex layouts and lane changes. Know and understand when, where, why and how to scan for road junctions. 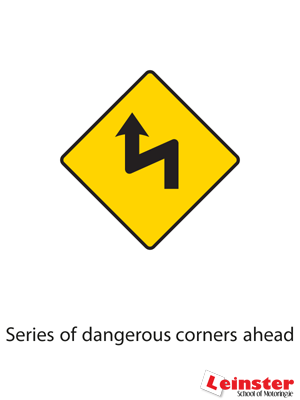 Be able to demonstrate consistently and without prompting the ability to anticipate potential dangers relating to road junctions, to take the necessary precautions and to react appropriately. Know and understand when, where, why and how to scan for cyclists and motorcyclists and be able to demonstrate consistently and without prompting the ability to anticipate potential dangers relating to cyclists and motorcyclists, to take the necessary precautions and to react appropriately. Know and understand when, where, why and how to scan for vulnerable road users and be able to demonstrate consistently and without prompting the ability to anticipate potential dangers relating to vulnerable road users, to take the necessary precautions and to react appropriately. The learner driver must have the knowledge, understanding and skills to drive through traffic safely, independently and consistently, at different speeds, in a competent and defensive manner and in challenging situations. The learner driver must be able to drive safely through traffic on busier roads and junctions, on faster roads and roads with variable speeds, and on roads with complex layouts and lane changes. Be aware of the importance of driving defensively at all times and be able, consistently and without prompting, to drive defensively at all times, while identifying and managing risks and dangers, maintaining reasonable progress and avoiding undue hesitation. Be able to demonstrate effective cooperation with other road users without impeding them and be able, consistently and without prompting, to identify hazards and obstacles and to deal with them effectively, while showing a high level of cooperation with other road users.